The German engineers of the Max Planck Institute for Plasma Physics (IPP) in Greifswald succeeded in producing the first plasma, no surprises here. The first plasma in the machine had a duration of one tenth of a second and achieved a temperature of around one million degrees. “We’re very satisfied”, concludes Dr. Hans-Stephan Bosch, whose division is responsible for the operation of the Wendelstein 7-X, at the end of the first day of experimentation. “Everything went according to plan.” The next task will be to extend the duration of the plasma discharges and to investigate the best method of producing and heating helium plasmas using microwaves. After a break for New Year, confinement studies will continue in January, which will prepare the way for producing the first plasma from hydrogen. 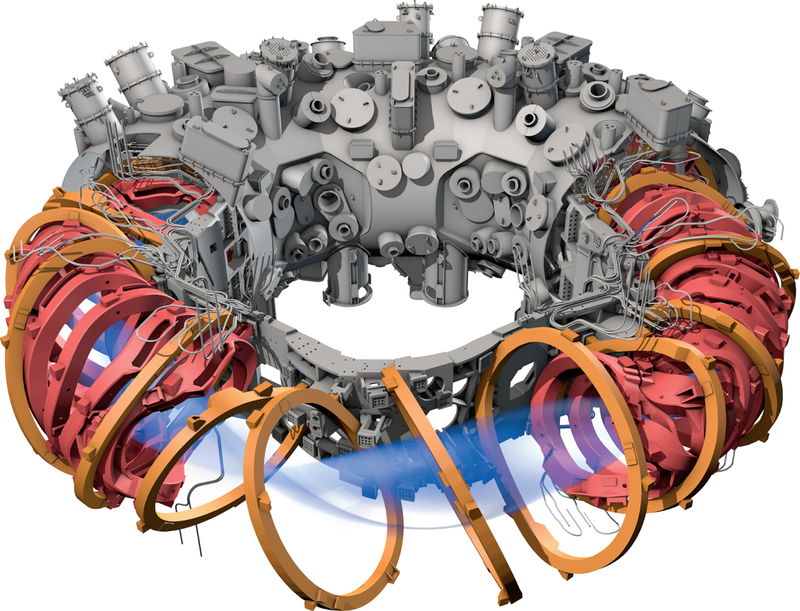 In Greifswald, Mecklenburg/Germany, scientists are exploring a new approach to fusion energy, away from the Tokamaks. The new €1 billion Wendelstein machine with a diameter of 16 m and was under construction for 19 years, is now ready to be switched on. The scientific community is holding its breath. Youtube text: Breakthrough technology: Charles Chase and his team at Lockheed have developed a high beta configuration, which allows a compact reactor design and speedier development timeline (5 years instead of 30). Lockhead Martin’s Skunk Works is famous for developing advanced technologies. Now Skunk Works Program Manager Charles Chase has outlined their plan for creating a 100 MW Fusion prototype by 2017. The NYT is pleased to let itself being used as a free advertising board for nuclear fusion. We are less convinced and happy to point out that mr. Prager is a partisan, with vested interests in the business and that he has designs on your wallet for that purpose. Lets make a deal… solar and wind exist and work. Why not install these devices first so we at least can survive the end of the carbon age. Garanteed. Once we have safely made it to the other side of the energy Rubicon we can always spend our scarce resources on this fusion hobby horse. The fusion fairy tale has had fifty years now to prove itself, that should be enough. It failed. Any guy who sends roses to a girl for half a century without ‘return on investment’ is rightly considered an idiot. Fusion does not want us. There are other girls.